Rotosound JK9 Super Light are the lightest gauge bronze acoustic guitar strings we stock. 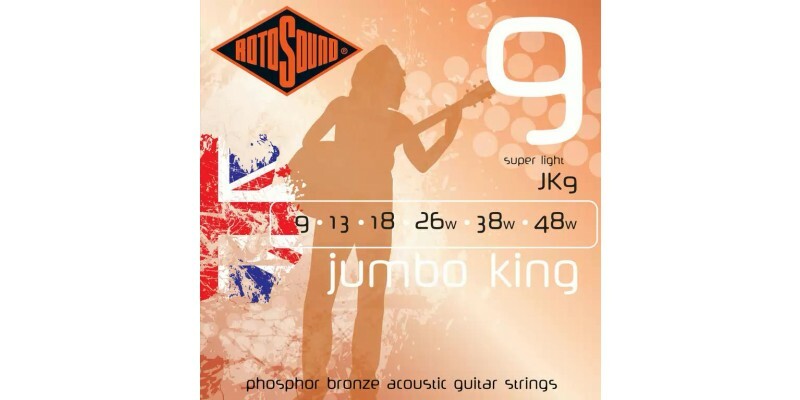 Rotosound Jumbo King are made in the UK and are a superb value Phosphor Bronze acoustic guitar string. Our best selling acoustic string. Phosphor Bronze wound Acoustic Guitar strings with superb warm tone, clarity and sustain. Favoured by such artists as John Renbourn and Bob Geldof. Available in five, six string gauges and three, twelve string gauges.